One of the great things about wine is its ability to work with food, to create a harmonious symphony, or indeed a discordant thrum, of flavour and aroma that neither of them on their own could match. Having said that, matching food and wine has never been a particular obsession of mine – with overwhelming frequency, what I fancy eating tends to pair pretty successfully with what I fancy drinking, and if it doesn’t I’m pretty happy just to stop drinking until I’ve finished my dinner. My basic equation is good food + good wine + good company = a good evening, but that’s forgetting the fact that other alcoholic beverages are available. There’s beer, of course. Matching beer and food is nothing new, and if done well is no less successful than wine (and quite a bit cheaper). I was memorably introduced to the concept a few years ago at the Norrebro Bryghus, a microbrewery and restaurant in Copenhagen (a coffee stout of theirs still lingers in the memory). Cider’s an option, at a push. Some cocktails could work. But I’ve always drawn the line at neat spirits. They’ve got their place – with a mixer or after a meal, basically – but on their own, straight, they’re so alcoholic they don’t so just exercise the palate, they annihilate it. But as ever I’m willing to put my body (mouth and liver, mainly) on the line in the name of research. And so it was that I went to the Indian restaurant Quilon recently, for a whisky-based dinner. As well as a Michelin star, they’ve already got a beer-matching menu and in the new year will add a whisky-matching menu to the list, and just to prove how seriously they take the subject they’ll also host a one-off dinner in February with Dominic Roskrow, somewhat obsessive author of The World’s Best Whiskies and editor of Whiskeria, in house magazine of The Whisky Shop. He’s done so much for bourbon he was recently appointed a Kentucky Colonel, and is so hot on Scotch he’s been made a Keeper of the Quaich. By way of warm-up, Roscrow also hosted my dinner, presenting four whiskies which were all dealt with before the meal arrived, so the focus of the evening wasn’t exactly on matching them with the food. He played his role well – clearly he takes whisky seriously, but he doesn’t think that everyone has to. His choices were good: varied, interesting and, in some cases, delicious (if anyone has a spare bottle of Henry McKenna Single Barrel Bourbon to hand, just send it right over), but a couple of them nudged towards a heady 60% abv, not really suitable for drinking with anything other than water, quite a bit of it, both in the same glass and in others. We were invited to keep drinking the whiskies once the food came, but frankly my glasses were empty by then, and some wine had arrived. Dinner, incidentally, was excellent. Almost no cream or butter is used, the chef Sriram Aylur suggesting that most diners should be healthier when they leave than they were when they arrived. That doesn’t mean that he’s in charge of a glorified WeightWatchers bootcamp, mind, just that you’re guaranteed to avoid the oil-slick-surfaced curries familiar from the British high-street. It’s excellent stuff, but I’m still a bit bewildered by its Michelin star – Aylur doesn’t just skip on the dairy, but also on the cheffy flim-flam that the Michelin inspectors tend to be so keen on. Our pudding was fruit salad. Sure, it came with a wonderful black pepper ice cream, but I never realised you could get a Michelin star for taking a grape off its stalk and chopping up a pineapple. The evening was a qualified success. I have resolved to give whisky more of my time (but not necessarily more of my mealtime), and to return to Quilon at some point without downing four glasses of 60% proof alcohol and a cocktail before dinner. I am a bit sad, though, that I never found out precisely where Roskrow keeps his Quaich. 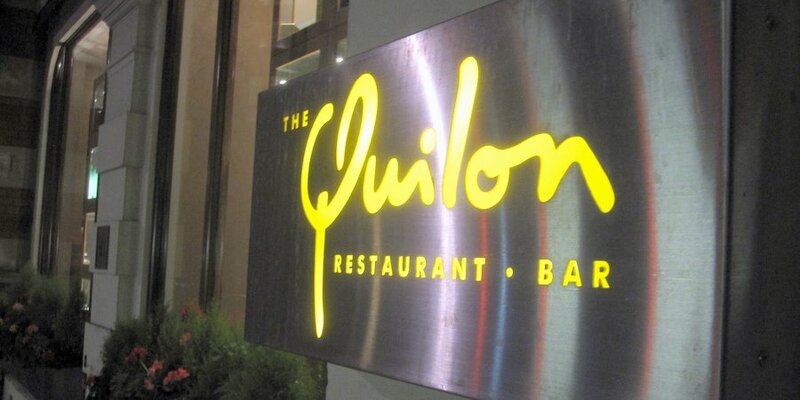 CF went to the whisky dinner as a guest of Quilon. Their next whisky dinner with Dominic Roskrow will be held on Monday 1 February 2011. Just 16 tickets are available, priced at £59.50 per person, and include a whisky cocktail, a tutored tasting of four super-premium whiskies, three-course dinner and service. For reservations call Quilon 020 7821 1899. This entry was posted in Uncategorized and tagged Eating out, Food, food matching, indian, quilon, whisky. Bookmark the permalink.